Both newbie and experienced bloggers have a wonderful opportunity to make quick money with event based niche blogging. You can make good amount of money with event blogging by putting very little effort. 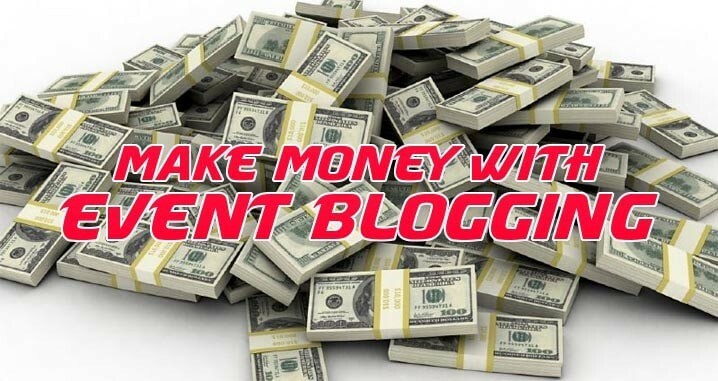 You can start a blog based on an event right from the scratch and earn up to $1000 – $10,000 in just few days. So read this article and follow Step 1 through Step 7 to learn how you can actually do it. Event Blogging and What is Special About it? In event based niche blogging you target a particular event occurring in a year. Your blog is designed for a particular niche. For example, you create blog for festivals like Christmas, New Year, Valentine’s Day or Super bowl. I mean to say a blog targeting only Christmas and another separate blog dedicated to Super Bowl, likewise. First you create an event based blog then get a huge traffic onto it (in just 1 to 2 weeks) and finally you make $$$ by monetizing the blog properly. What is special about the event based niche blogging is the money you make. In just 2 to 3 days you can earn up to $2000 – $10,000 (for one event). Moreover you start your blog just 40 – 50 days before the event. Therefore it means you earn sizeable amount of money working just few days before the event. Less hard work but high income! So let us get started. The first obvious step that you have to take is choosing an appropriate event. Here is the list of different categories of events you can choose from. Holidays: Christmas, New Year, Thanks Giving, Valentine’s Day, Diwali, Halloween, Father’s Day etc. Visit TimeAndDate.com and you can find all kinds of events specific to your country. A newbie usually gets confused while choosing an event because there are so many happening around the world each year. You have to choose an event that you know most about. ‘Cause later on you will be creating good content for the event you just choose. Second factor you need to consider is keywords. You have to choose an event with most searches. You are going to include these keywords into your content. We talk about keywords in great details later in this paragraph. The third factor is timing. You have to choose an event according to your experience as a blogger. Experienced blogger can choose events which are about to begin in 10-15 days but a newbie needs more time. We talk more about timings in the following paragraph. But for now as far as choosing an event is concerned you have to consider these three factors. I need a whole new paragraph just to emphasize the importance of starting your event based niche blog at a right time. You can divide bloggers into 3 levels depending upon their experience. If you are a new blogger with zero experience then you need 3 – 4 months to start prior to the event. But if you have done some blogging and know how to set up a blog with knowledge of basic SEO then 45 days would be enough. If you are an experienced blogger and already running a website with an old domain then you can start just 20 days prior to the event. So start according to your expertise. Once you are done with the choosing an event to promote you need to do a thorough keyword research for your blog. Keyword research is the building block of any SEO (On Page). I will keep it very simple. In event blogging you have to choose keywords that can give you maximum traffic and help your site rank high in a short period of time. So you have to collect keywords with a lot of monthly searches. The most effective free tool that you can use is Google Keyword Planner. You can also use other tools like Keyword Tool, Long Tail Pro etc. There you type the keywords like “Halloween” or “Christmas” or “New Year” etc. It will show a result with hundreds of keywords people search in Google. You have to copy all the keywords with maximum monthly searches of over 2 million and the minimum of 100,000. Sort down the list according to the competition. The ideal keywords would have high monthly searches and low competition. It is always better to target long tail keywords. One of your main goal is to target just one main keyword which has very high monthly searches. At the same time you are also going to use all other similar keywords related to that same event so that you can get much more additional traffic. Let’s take an example of Valentine’s Day. Valentine’s Day has searches between 1 million to 1 millions so this is your main target. But there are many other long tail keywords shown below that you can target. Valentines day 2016 – 100K to 1 Million searches (you need to change 2016 to current year). And many more similar keywords that has more than 10000 monthly searches but most of these keywords are searched during that event only so you can imagine how much traffic you can receive if your site gets ranked in Google with these keywords during the event. Most of the above keywords has low competition. So you don’t need to work very hard towards SEO. In step 3 you are going to book a domain name under your main keyword. You can use Go Daddy for searching a new domain name. Type in your main keyword in the search bar and look out for the domains that are still available. It is quite often that somebody else has taken the domain name which you are also looking. So you can do little bit of variations and look of other domains without changing the main keyword. For example if your main keyword is “Halloween Dresses for 2018” then you can go for Halloween-Dress-For-2018. But try not to add a new word from or to your main keyword. If .com is not available, you can also try .info, .us, .biz extensions if you are able to keep your main keyword as it is. So buy a domain name. For hosting you can use free hosting from Blogger.com or even try managed WordPress hosting. Most of the people use hosting from blogger. You can check this video to add your custom domain name from GoDaddy to blogger hosting. It is very simple. 4th step is creating good content. Usually bloggers don’t take content seriously because they focus more on SEO. You can’t replace good content with SEO. Or in other words you can say good content itself means effective SEO. How Much Content You Have to Create? Although quality matters but regular bloggers can stick to a formula. If your one post is 2500 – 3000 words long then you can have 10 – 15 such posts updated weekly but if your posts are just 500 – 600 words then you have to write over 50+ posts updating every single day. While creating content you have to target all the keywords (including main keywords) in different posts. Your headings and sub headings must include these keywords. You are also required to scatter keywords wisely so that it does not look spam. For per 1000 words use 3 to 4 keywords. On-page is in your hand so you must give your 100% for on-page SEO. You should use original images or copyright free images from the web for your posts. Image name should be your keyword and you you must use your keyword in image alt tag. Until now you were reading very regular stuff. But the real article starts from here on. Event based niche blogging is all about SEO. You will be surprised to know here you have to employ Black hat methods too which is against the guidelines of Google. So before you read more about the on page and off page SEO you need to keep in mind that there is a very thin line between right SEO techniques and blackhat SEO tricks. For event based blogs you have to do SEO in a way that Google doesn’t slaps you but at the same time you are going to implement certain Black hats tricks without getting noticed by the Google. For on page SEO you have to do very basic things. On Page SEO would be about content and tweaking with HTML Code. Most of the On Page SEO is covered in Step 4 while you are creating content. Your each page title must include the main keyword of your event blog. If the main keyword is “Halloween Party Costumes 2018” then page title must be exactly same. You can bring some variations if you like. Your article must contain at least three sub titles or tags H1, H2 and H3. H1 tags are for main page title and it must include your main keyword with little variations. Similarly for H2 and H3 tags use other important keywords you created while keyword research. You have to prioritize listing keywords. H1 must contain Main keyword and H2, H3, H4 should contain other keywords. Your keywords for a particular niche must be scattered all around the content. For a blog post keyword density for your main keyword should be 1 keyword per 300 words. So for 1000 words long article include just 3 to 4 main keywords. And for the rest of the article use other keywords. Don’t overuse keywords. Images are great for SEO for alt text and descriptions use all the relevant keywords. Go to the source code and in Meta Description use all the relevant keywords including the main keyword. Here you must use all the specific keywords with a length of 160 characters. For each web page you can include keywords in the form of Meta Title. Try to include as many as keywords in Meta tags. You can write up to 70 characters. Never ignore internal linking of web pages. It not only makes easier for visitors to navigate pages but also allows Google crawler to crawl your website easily. Internal linking increases Google Page Rank for a website. The two main internal linking structures are content links and permanent navigation links. Place links within your article and redirect it to other relevant pages in the blog. So structure your website carefully with linking relevant pages to each other. Structure all the URLs of your site properly. For example website.com/keywords is better than website.com/239/124//keyword. Include relevant keywords for the URLs for each blog post. Shorten the URL. Step 6 is everything. In fact niche blogging is all about Off Page SEO (link building). It really doesn’t matter if you haven’t read the previous steps. What matters most is the step 6 and that is essence of event based niche blogging. Although I never recommend blackhat SEO but most of the people who make money through event blogging use this technique to get fast ranking in Google. There are high chances that your site will get penalized by Google but who cares if you are not aiming to use this site after the event. You need to create large number of backlinks in short time so that you will get fast ranking in Google. Here are some of most used link building methods along with ways to make it fast. Although Google has penalized all PBN and the sites getting the links from these PBN but this is still the most preferred way for many of the internet marketers. If you create a PBN of 50 blogs then you will be able to rank most of the event blogs successfully. But creating an effective PBN and posting links there is an art. You must be an expert before creating your own blog network. Here is the best way to create your PBN and some of the tricks you can use to make it effective. Research ExpiredDomains.net for quality expired domains with high DA & quality backlinks. Make sure the domain was not penalized by checking its history in Archive. All the domains you purchase must be hosted on different IPs. There are many hosting companies which provides hosting for $5-$10 a month. Otherwise you can go for PBN hosting from many companies. Publish 400-1000 words unique articles once in 5-10 days on every blog. Don’t take more than 2 links from 1 blog in PBN for 1 event blog. Post 2 tier links if you have created articles on article directory or web 2.0 sites for indexing and giving power to your backlinks. Remove all the links from all the PBN blogs once the event is over irrespective of your site is penalized or not. Use anchor text variation. Also add exact anchor text + domain name. Try to post original content instead of spun. You can find number of cheap writers who can write a 500 words article for just $1. I want to be blunt here! It is spamming. You have to spam backlinks. Find all the Auto-Approved and dofollow blogs for your niche and spam them. You should start at least 20-30 days before the event because it takes time to index your comment backlinks by Google. You can easily find auto approved blogs using tools like AHrefs and Cognitive SEO. You can also invest in tools like Scrapebox which can help you posting thousands of comment across thousands of different blogs. And if you don’t have much budget, you can buy a gig on Fiverr for this purpose. Sitewide links are very important for event blogging. With sitewide link you can get a lot of backlinks by doing almost nothing. For example, if you ask for a sitewide link from a blog which has DA of 30 and 200 pages indexed in Google then Google will consider 200 links from 200 pages for your event blog. Sitewide links are placed at blog’s sidebar at header or footer. The sitewide link will be shown on the these places of every single post in that blog. You can search for sitewide link sellers on Fiverr, social sites or SEO forums. But be careful because if you do it in excess, it can penalize you even before the event. Start 20 days prior to the event. The third method is directory submission. You have to find good directories to submit your blog and finding it could be slightly difficult. You can automate this process to find and submit your event blog in hundreds of directories. If you want to go one step further then you can maximize your SEO efforts by submitting articles with your links to article submission sites. There are many SEO tools like SeNukeXcr, XRummer etc. that will help you posting your articles on article directories & web 2.0 sites and even indexing these submitted posts. If you want more backlinks then you can leverage the power of social media and popular forums. I would recommend to use Facebook and Twitter for social signal. Although for event based niche blogs social media is optional. What matters is first 5 methods I just mentioned above. In event based blogging you will be making a lot of backlinks in just few days. You have to be careful while building backlinks so that Google doesn’t flag you as a spam. Timing is very important. If you are a newbie then start early because you can’t make all the backinks in just 7 days before the event. Get backlinks from high DA blogs only. Just 1 or 2 sitewide link is enough a week before the event. Perfect Ratio – Your blog must have perfect ratio for outbound link versus inbound links. 80:20 is the best. Anchor text variation is very important to avoid Google slap. KEEP MONITORING YOUR BACKLINKS – Tracking your backlinks is very important because anytime Google can mark it as spam. Buy domain name 6 months in advance and the domain name should be same as your main keyword. Consider template, theme and design as a part of your SEO strategy. Content is King – Don’t ignore content. SEO is of no use if your content is not good enough. The final step would be monetizing your blog with contextual ads or affiliate marketing. Google AdSense is best for contextual ads. For affiliate marketing you can promote a product closely related to the blog’s niche. For beginners I would suggest using Google Adsense. For higher CTR you need to place ads at right position and use these tricks to maximize AdSense earnings. If you follow Step 1 through Step 7 then you can easily make $1000 – $5000 in just 4 to 5 days. After being successful with one event based blog you can rinse and repeat. Try for other events and create more and more blogs. You followed Step 1 through Step 7 and you didn’t get the desired results. Well don’t lose your calm. Try once again. This time you must remodel over other competitors who are already successful. Make a note of all the websites which are ranking on the top for a particular keyword. Analyses these websites from all angles, check their backlinks, anchor text, meta tags, description, all the keywords and off course content. Try to remodel after them. So this is all you need to know about making money with an event based niche blog. Thanks for this relevant and wonderful article of event blogging. I found multiple tips on it and would try to implement them. 1. Last year income from this site. 3. Your site hosting plan. If, you share so, I sattisfied about make mony from blog. Blog seems tu b a gd way tu earn money , the problm z hw tu creat a blog. I do agree By event blogging, we can earn huge money in short period of time but it requires lot of seo efforts as compared to normal blog. But surely we can learn lot of things. Hi..this is Hemali .. could you please guide me if I want to blog somthing related veg food and how to blog. How to go about through net. Nice post thanks for sharing , i have written blogs on PR Events in my company .Now I am looking forward to post blogs on Special Ocassions like festivals . I am subscribing to get future updates about event blogging. Please am a bigginer and i dont understand this article, can anyone help? I would like to know more about blogging. I am a complete beginner and know nothing about blogging. What do I do to learn it..? Where to start..?? Please help me..!! I do not know any thing about blog. However, I have just written a quiz (about 90-100 questins and answers) on Indian union budget. Pl. advise how you can help me. Wow! It is really a great guide. i failed in my first Event Blog but now hoping that this time, it will make any progress. That’s a wonderful article on Event blogging. I am doing it part time from last 2 years. Last year alone, I made around $6000 from just 3 events. But I was not doing many of the things specially PBN. I am really thankful to you. This year I am targeting around $10000.